Last Sunday, the kitchen garden day was a great success. The meet up was after noon so most of them had enough time to attend many other events happening in and around Bangalore in the morning. . I had packed all my seeds, labeled them and was all set for the meeting to begin at 1 PM. Exactly at 12:55, I get a call from the early birds regarding the meet. I was excited and motivated because of their punctuality. I received them and we went to the meeting hall. While we were discussing, a few more entered. More introductions happened. In just a matter of minutes all the seats were taken and we were house full . After an initial round of introductions, we started discussing about everyone’s garden and what they were growing. Slowly it became a full-fledged question and answer’s session which was good. 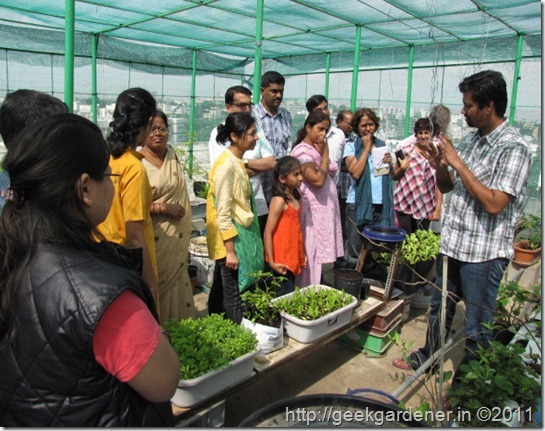 I took this opportunity to give a short session on how to start a terrace/kitchen garden. This session, woven with questions and answers took a good couple of hours. There were seeds and plants on display. Some of them swapped and others bought the seeds. The most sought were the strawberry plants brought by Asha. I had a tray full of Parsley, tomato and coriander seedlings to giveaway. After the talks, we went to the greenhouse for a short guided tour. We had fun! Look at the picture below. To all who made it to the event, Thank you so much for making it a memorable event. I really appreciate people who came all the way from other side of Bangalore such as RT Nagar, Yelahanka, Jakkur etc… It shows your passion towards gardening. To those who missed, not to worry. There will be more such events in future, so watch this space. Dear GG, I wish I’d been there. Unfortunately my trip to Bangalore didn’t materialize. My mother-in-law attended the event though; she told me that it was indeed a grand success. Wishing you many such successful events. Dear GG, Great work! I wanted to see your green house! I missed it too, could not make it on that day. Hopefully you would have another event soon… Congrats for this effort. Congratulations to all for the grand success. Really nice to see ppl coming from such far away places. Congrats to you! On my side, i have moved to Taipei,Taiwan for a new job opportunity. I have a small terrace garden here too but haven’t done anything serious till now. The house owner just has some fancy plants on the terrace. Hopefully will start my kitchen garden soon. I had a nice time, though I did come late – I’m so happy to have another set of seeds which I’m looking forward to plant. Bokchoy, Cherry & Carorich tomatoes, Lettuce, Leeks… what I like about your collection is that its not something we easily get around and I have had good success with them in the past! And I am so happy to get that ‘adding lime to the soil’ doubt cleared just in time because I had just got 3 packets of the wrong variety and would have dumped it! It would be a good idea to know what seeds/seedlings you have (maybe a list somewhere) as well as what others plan to bring if there is a swap. May help the planning for us better. Thank you very very much and looking forward to many more such events. Thanks a lot. It was a fun event and planning to conduct more such events in future. Will keep you all informed. Looks like a great time was had by all. Too bad I live in Barbados.Do you have problems with butterflies over there? After laying eggs on my veggies the worms hatch and destroys my plants. Do you know of any natural remedy to spray plants with? Any ideas would be appreciated.Also one of the members mentioned receiving strawberry plants do they grow in your climate.I have a few plants in a semishaded area and so far has harvested 2 strawberries. 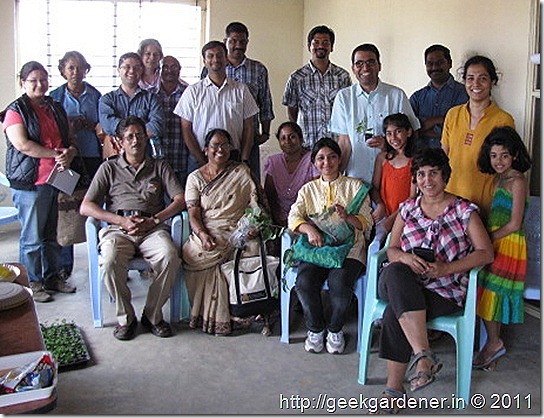 I wanted to attend but could not as I was out of town…I am a begginer and would like to know if you have any seeds that are available that I can buy from you… to start my kitchen garden. any easy to maintain veggie, fruit, herb seeds would do… I have been in search of Basil, parsley, rosemary, thyme seeds. your help would be highly appreciated! Sad that I could not make it up. I do have quite a few good seeds I had collected from an NGO. I would like to share them with others and get some seeds useful for me. I suppose we can plan for such meets every 2 or 3 months and in difeerent gardens. Congrats! It’s a nice feeling to see so many enthusiastic people, with pretty smiles. I am Vasavi and am new to the gardening stuff. I just started doing this and found your blog. Where do you stay? I do want to visit your green house. PLEASE let me know when you organize your meet or class next time. I stay in Blore. Will the meet be addressed in English? I am a non kannadiga! Was looking for a gardener in Bangalore, and hence came across your blog. A wonderful place and great resources. I am in the process of starting up my garden. The house where I stay has a small patch outside, which is just overridden with weeds and wild plants…nothing of any use. There is a curry leaf tree which seems to be afflicted with some disease.. the leaves are a brownish green. There is a tree on the road which keeps shedding all the leaves onto this small patch… which makes the whole place laden with leaves every few days. So… as you see its gonna be a difficult task to maintain this place. But, I want to start a small veggie place! Nice to se all the comments. Now i want to start a kitchen garden in my terrace, i am in hyderabad. can you suggest someone who can guide me ? I am a new member to this group. I am from Chennai. Really nice to see some of the initiatives taken. Anyone from Chennai in this group? This is my first visit to the blog. I have just started with terrace gardening. i loved to see the blog with awesome information. I have just started to grow coriander, ginger, green chilli. beans, tomato, mint and methi. Would definitely be a regular visitor to this blog for more info and more and more doubts in my gardening. Please be ready to help me out. Could I request you for some incase you have with you? Would HIGHLY appreciate any help / lead on this. I would like to participate in the next event ,, plz let me know if there is anything planned in the coming months ..
please keep me informed about next event. I too will join.